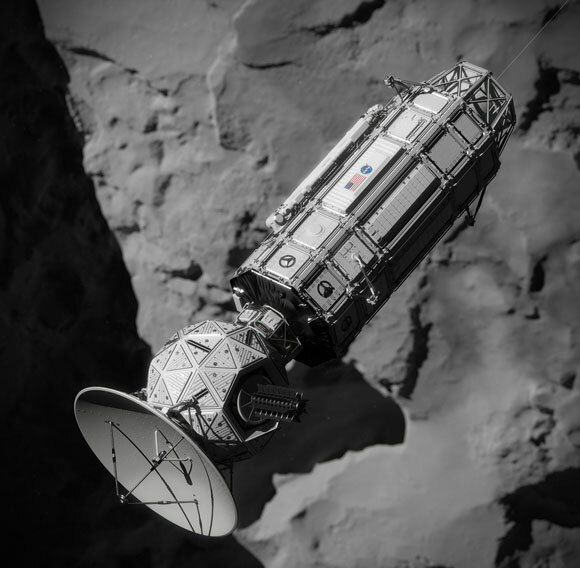 Comet Hitchhiker is in Phase I study through the NASA Innovative Advanced Concepts Program. 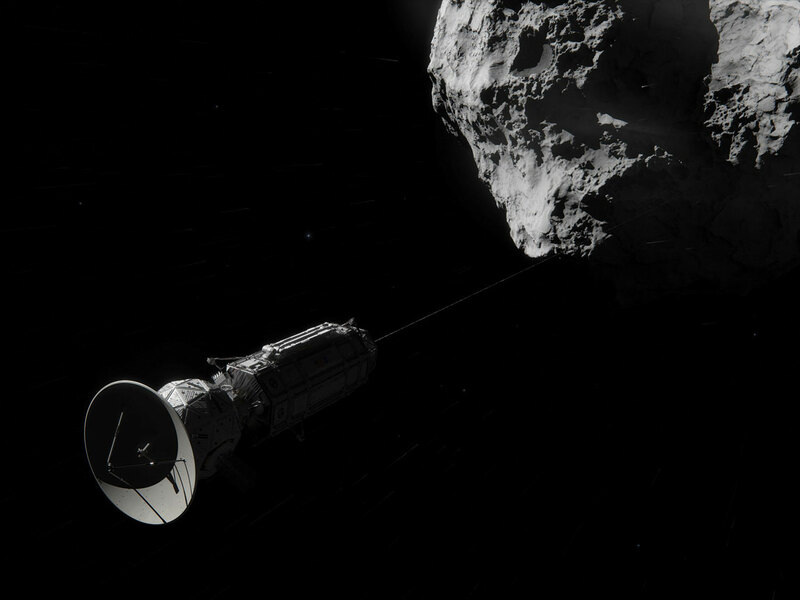 Its goal is to use the kinetic energy of comets and asteroids to get into orbit and land on them. A concept called Comet Hitchhiker, developed at NASA’s Jet Propulsion Laboratory, Pasadena, California, puts forth a new way to get into orbit and land on comets and asteroids, using the kinetic energy — the energy of motion — of these small bodies. Masahiro Ono, the principal investigator based at JPL, had “Hitchhiker’s Guide to the Galaxy” in mind when dreaming up the idea. Once the spacecraft matches its velocity to the “fish” — the comet or asteroid in this case — it is ready to land by simply reeling in the tether and descending gently. When it’s time to move on to another celestial target, the spacecraft would use the harvested energy to quickly retrieve the tether, which accelerates the spacecraft away from the body. But the bigger the velocity change required for orbit insertion, the shorter the flight time needed to get from Earth to the target — so if you want to get to a comet or asteroid faster, you need even stronger materials. A 6.2 mile-per-second (10 kilometer-per-second) velocity change is possible, but would require more advanced technologies such as a carbon nanotube tether and a diamond harpoon. Comet Hitchhiker is in Phase I study through the NASA Innovative Advanced Concepts (NIAC) Program. NIAC is a program of NASA’s Space Technology Mission Directorate, located at the agency’s headquarters in Washington. Professor David Jewitt at the University of California, Los Angeles, partnered in this research. JPL is managed by the California Institute of Technology in Pasadena for NASA. 1 Comment on "NASA Comet Hitchhiker Would Take Tour of Small Asteroids and Comets"
Hello, Elizabeth. Just wondering what the acceleration of the satellite would be. Is it 0.9 miles per second per second or 0.9 miles per hour per second.